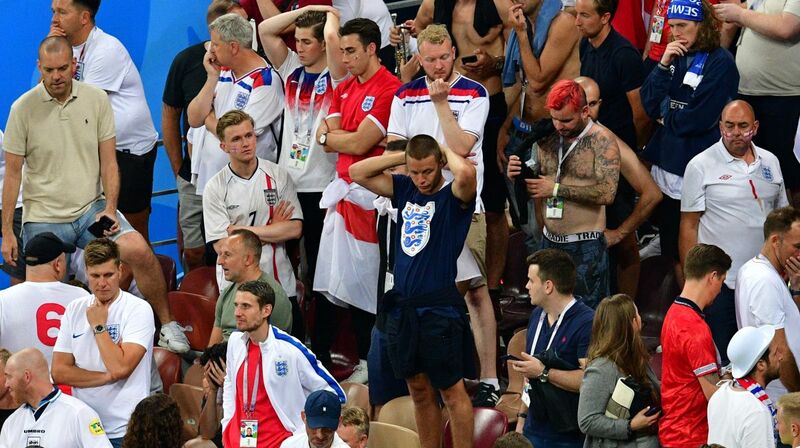 An initial wave of elation turned to heartbreak as 30,000 beer-soaked fans in London’s Hyde Park on Wednesday watched England lose an early lead in the World Cup semi-final against Croatia and come up short once again. “I’m really, really sad,” said a tearful Laura Russon, 31, clutching an empty bottle of cider. Crowds of glum-looking fans swiftly streamed out of the venue, as some stayed behind to applaud the young team’s surprising success in Russia. Early on in the game, optimism had ruled. Under the clear blue skies of a beautiful summer’s evening, beer rained down as fans celebrated an early England goal in their first semi-final appearance in 28 years – a prospect which had seemed virtually impossible at the tournament’s outset. “This is the first time in my life England have made it anywhere near this far,” said 23-year-old Murad Huseynov, draped in a red and white St George’s flag. Over half the current squad were not even born when England last played a semi-final in world football’s top tournament, while manager Gareth Southgate was born four years after their last final in 1966. Shaun Bailey, a 48-year-old IT worker, reminisced about watching England lose their last semi-final, in 1990 to then-West Germany “on a wooden TV balanced on a Coke machine” while at the university. “Times have changed — it was 28 years ago,” he said, noting the current team’s style differed from the individual stars like Paul “Gazza” Gascoigne who grabbed headlines then. “We haven’t really got the players now, but we’ve got the team,” he said. The Hyde Park screening was the largest of its kind for an England game since 1996, when the country hosted the European Championship and the team made the semi-finals. The 30,000 free tickets were snapped up within minutes in a ballot held Monday afternoon by organisers the British Summer Time (BST) festival. It postponed a planned event at the park site to allow fans to watch the game on several giant 94-metre by 11-metre screens. London Mayor Sadiq Khan, who helped organise the event, asked for a family-friendly atmosphere after instances of disorder following England’s quarter-final victory over Sweden on Saturday. He arrived shortly before kick-off to a joyous scene of free-flowing beer, oversized inflatable footballs bobbing around the crowd — and the now ubiquitous chorus of “Football’s coming home”. England’s resurrected Euro ’96 campaign song by the Lightning Seeds was even performed by the band ahead of the game to a rapturous reception from the largely youthful crowd decked out in England shirts and flags. England’s only goal in the game sparked scenes of pandemonium, only to be replaced with eerie silence as Croatia equalised early in the second half and then snatched victory in extra time. As the game dragged on, the crowd tried to rally the team from afar, launching into several renditions of the national anthem “God Save the Queen”. “The atmosphere’s been absolutely electric,” said Michael Grant, 36, a London property developer. Up and down the country, an estimated 30 million people watched the game on television, packing anywhere with a screen, from pubs, bars and restaurants to rooftop screenings, outdoor spaces and cinemas. For some, England’s success in reaching the last four has brought a much-needed sense of unity in a country still wracked by divisions over Brexit. “It’s brought everyone together at a time when they needed it,” said teacher Louise Smith, 34, as she celebrated the game in Hyde Park with friends. The team’s unexpected advance through the competition has coincided with weeks of uninterrupted sunshine across the country — equally rare in rain-sodden England. It had left some wondering if this is the new normal. “You don’t get success in football and good weather in England,” said Nikki Langley-Essen, 38, a London events manager enjoying the novelty of both. As fans left Hyde Park — now a sea of rubbish — 27-year-old Henry Ludlam was optimistic for what lies ahead for England. “It’s such a young team and there’s so much chemistry for the future, he said. “In four years, we’re going to be unstoppable.